Caroline Kinneberg arrived in Southeast Asia, trekked the countryside by motorbike, made friends with strangers, and had a hard time leaving her hotel room. 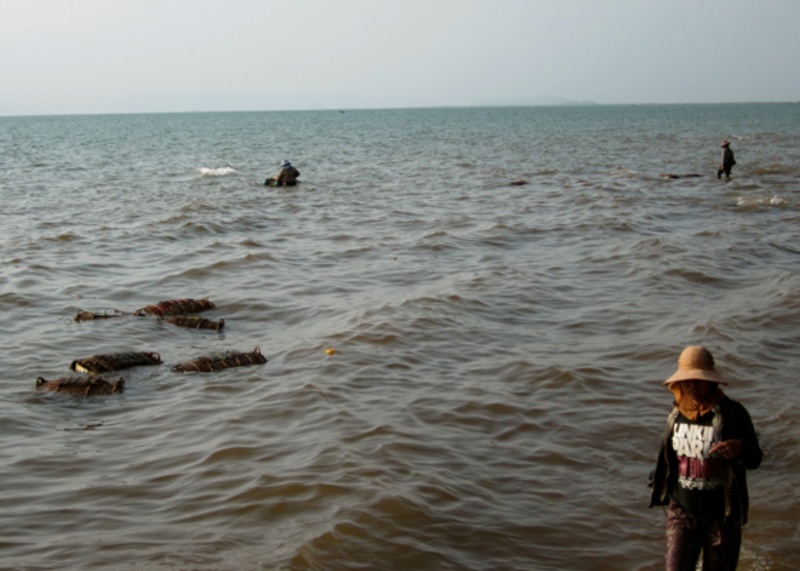 CAMBODIA – I know you're not supposed to do this. Hotels are the inauthentic part of the voyage. They're inherently for those who are not local. But when my boyfriend and I were not busy looking for the "real" Cambodia during our two-week trip — the final three nights of which were devoted to recovery in Bangkok — we had to rest our weary heads somewhere. Moving around nearly nightly, we tried out a smorgasbord of high- and low-end hotels, which turned out to be a highlight of the trip. Koh Thmei Resort in Sihanoukville Province: After hearing that the string of islands known as Koh Rong (ranked 23 on the New York Times list of 45 Places to Go in 2012) was losing its unspoiled panache due to tourist overkill, we decided to visit someplace less accessible. 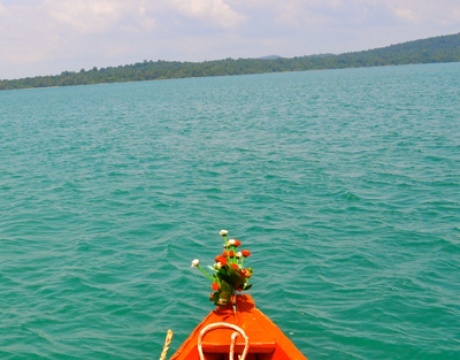 Whereas travel to Koh Rong takes 30 minutes by speedboat via the southern coastal hub of Sihanoukville, we rode for an hour by van from the city center to reach Koh Chang fishing village, then traveled by sputtering dingy for yet another hour to Themi. The sun sets violently in Cambodia, and though we started our ride in the light, we found ourselves plunged in complete darkness on the Gulf of Thailand, save for the sporadic waving of a flashlight. The speck of light denoting Koh Thmei Resort, the only occupant on an otherwise deserted island, grew larger as we approached. Michael and Kativa, creators of the paradisiacal haven, are an inspiration to anyone looking for a life change. Not knowing more than simple phrases in Khmer, the couple uprooted from their native Germany, bought three hectares of land from the semi-corrupt Cambodian police, built seven comfortable bungalows, and learned how to create electricity, dispose of trash (hungry pigs and fire), and do whatever else needs to be done to maintain land in a country without much infrastructure. The first guests arrived December 2010 and ended up staying nearly two months (we were tempted to do the same). Kativa runs the restaurant where we marked our order on a notepad and carried it to a spotless kitchen filled with fresh ingredients. Our average tab per day: $35 for two. We whiled away the hours snorkeling, sunning, and cautiously exploring the backyard jungle. Everyone got to know each other around the bar with a beer and Uno cards (and sometimes a joint) in hand. It's the kind of hideaway your finance friends go to the Maldives for — but this one's $1,000 less a night and filled with much cooler people. Veranda Natural Resort in Kep: A Glaswegian couple also staying at Koh Thmei hipped us to the beachside city of Kep, which is known for its crab market. This resort is ingeniously constructed like a gigantic treehouse straight out of Neverland. The cheapest room available when we showed up dusty and sweaty from a ride on our bedraggled motorbike (missing a rearview mirror and a license plate) was the penthouse-style Rosewood Room. For just 70 bucks per night, we couldn't say no. Integrated into its surroundings with tasteful organic decor, the luxury hotel is built into the mountainside and has spectacular vantage points. Two walls of our airy bedroom sported giant glass sliders opening onto private terraces, so our view of Kep National Park's tropical green waves was particularly well-framed. Mandarin Oriental in Bangkok: This is the part of the story where I pay dearly for scarfing Kep crab with my dirty bare hands and inhaling iced beverages from street vendors on our motorcycle journey. We took Thai Airways back to Paris (where we live), and since the flight from Phnom Penh had a layover in Bangkok, we spent a few nights unwinding from our backpack adventure at the luxurious Mandarin Oriental. The bed was an envelope of heavenly white clouds. My boyfriend, deep in dreamland, didn't wake up to hear me run, literally 30 times, to the bathroom on our last night there. 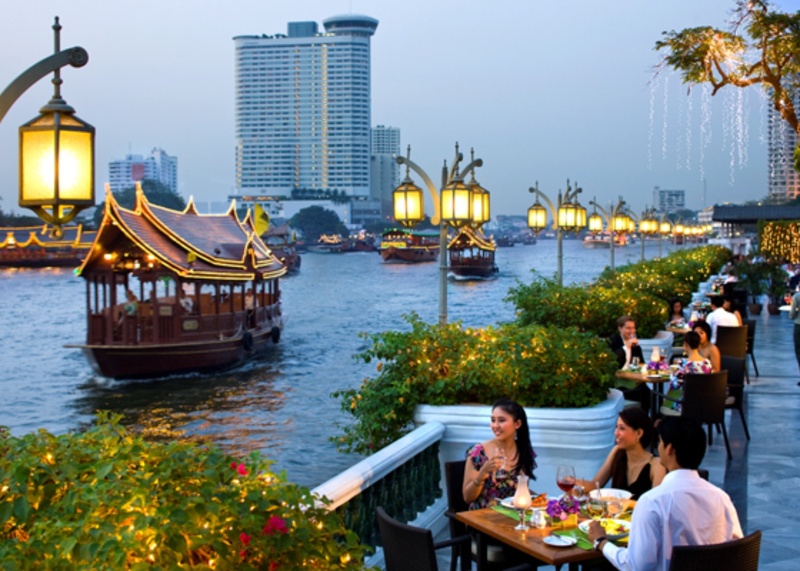 The first luxury hotel in Thailand, opened in 1876, it's everything you'd expect from a Mandarin plus more: gorgeous complementary riverboat shuttles to avoid road traffic, smoky jazz performances over drinks at Bamboo Bar, exceptional customer service, and illuminated terrace dining overlooking Chao Phraya River. Not to mention a handy clinic (with an English-speaking medical practitioner) on the second floor. Sala Bai in Siem Reap: The city is infested with tourists. The only interesting experience we ended up having here was dinner in a sign-less hole-in-the-wall filled with off-duty tuk-tuk drivers. The dinner: a burgundy-colored fish meant to be eaten in its entirety, since it had been boiled for three days to render its bones squishy and edible. I called the experience interesting, not palatable. However, when we got on the bus to head down to Sihanoukville, we picked up fellow passengers at Sala Bai hotel. They had smiles as big as an enlightened buddhas on their faces (as did the staff that waved them goodbye) and wouldn't stop raving about their stay. I safely assume their dinner the previous night was a step up from ours. Romdeng in Phnom Penh: Several restaurants and hotels throughout the country double as service industry training schools. We fell in love with Romdeng, a restaurant staffed by former street youth. The food (fish and pumpkin curry, crispy rice noodles with tofu and taro spring rolls, watermelon juice) was some of the best on our trip, the kitchen was impeccable, and the location, a secluded French colonial manse plunked in the midst of the bustling capital, stunning. 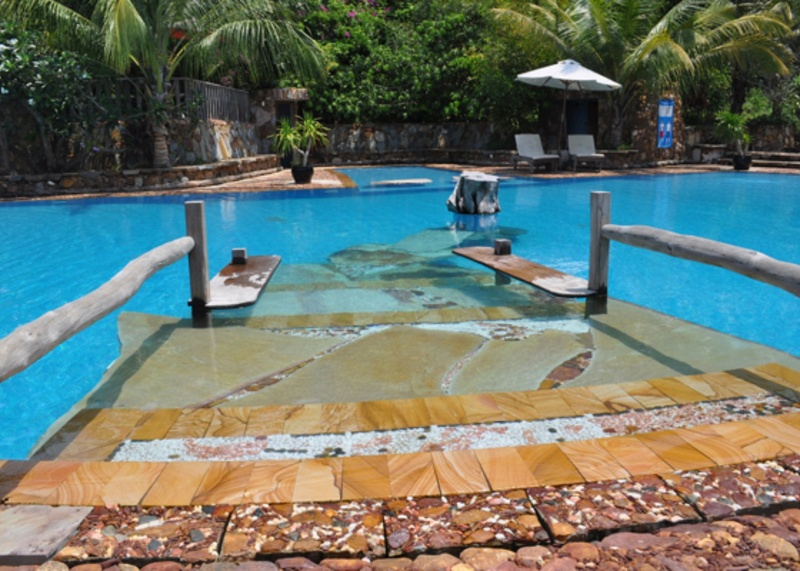 Shanti Shanti in Sihanoukville: French co-owner Sophie, blonde and dreadlocked, is the one who recommended staying at Koh Thmei. Her three elevated bungalows at the far end of Otres Beach fill up weeks in advance. We called too late and missed our chance, but we did enjoy delicious palm sugar-sprinkled pancakes ($2.50) at her place while picking her brain about where to go instead. Give yourself time to get from place to place. Skinny oxen, barefoot children, cyclists, and Texas-size SUVs, all traversing potholes, does not make for optimal travel speeds. 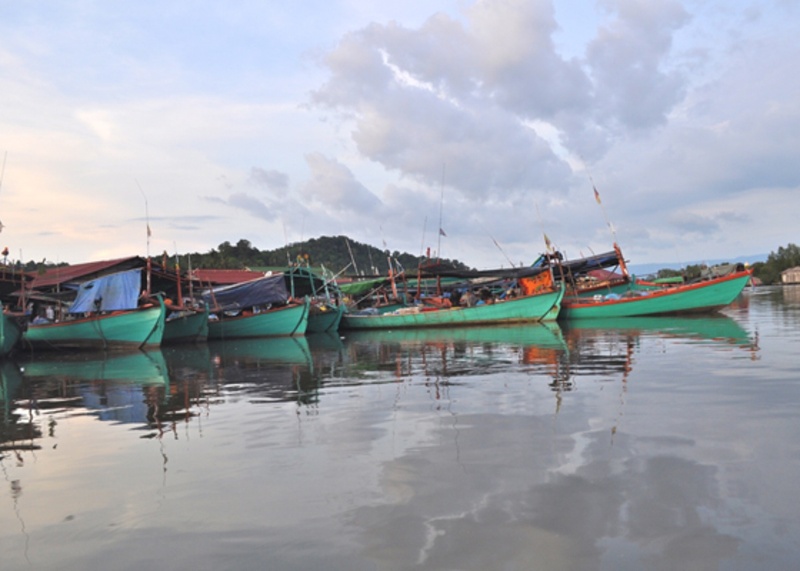 The trip from Kampot to Phnom Penh takes five to six hours by bus though the two destinations are only 75 miles apart via national highway. Hack that time in half by hiring a taxi ($40) and traveling during daylight (the majority of roads won't be lit at night). Bungalows: $15/night. Lonely Beach was recommended to us for a similar experience, but we didn't get the chance to check it out. Deluxe bungalows: $55 /night (low season). Apartment: $250/night (peak season). Bungalows: $20-35/night. Prix fixe menus: $6-8. 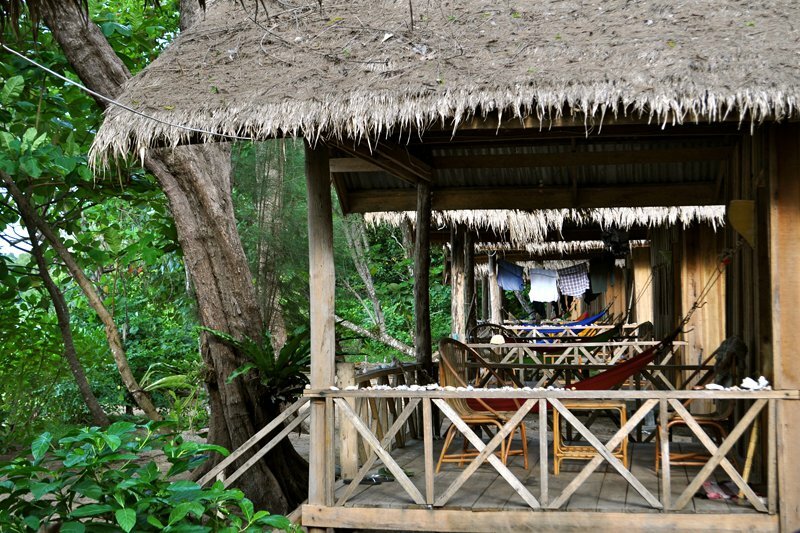 Bungalows: $15/night. An eleven-meter sailboat (and skipper) can be rented for up to five people (snorkeling gear provided): half day, $100; full day, $150; 24 hours, $200. Caroline is a writer and editor based in Paris. She travels for the stories and stimulations. You can find out more about her at carolinekinneberg.com.